[Review] Gradius (NES) – I ❤ Old Games! 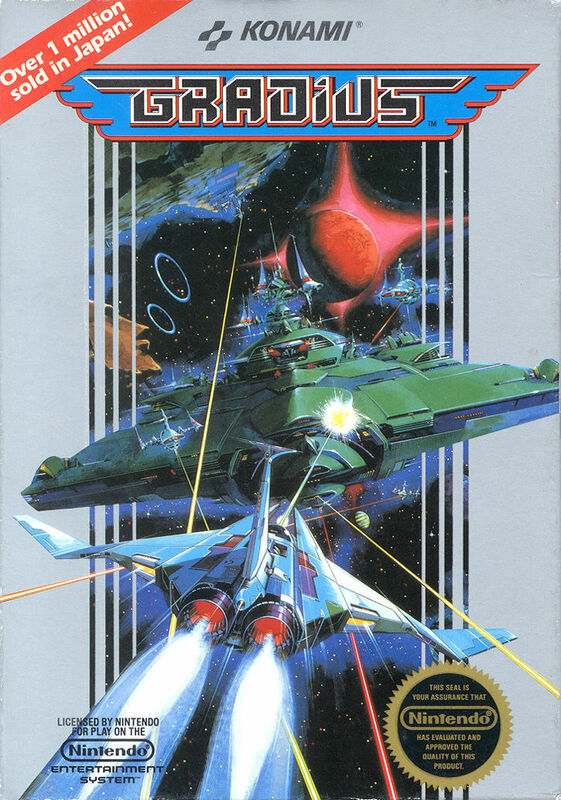 Gradius, also known as Nemesis is one of the most influential shoot ’em up of all time. Released for the Arcade market in 1986 was quickly ported to the NES and then almost to every platform (Commodore 64, ZX Spectrum, MSX, PC Engine, Amstrad CPC, Game Boy, TurboGrafx-16, Sega Saturn, Sharp X68000, NEC PC-8801, MS-DOS, Game Boy Advance, Microsoft Windows, PlayStation 4 and PlayChoice-10). Probably There wouldn’t be no R-Type and no Darius without this game which was the first with a biomechanical setting, that will become the standard for the genre. 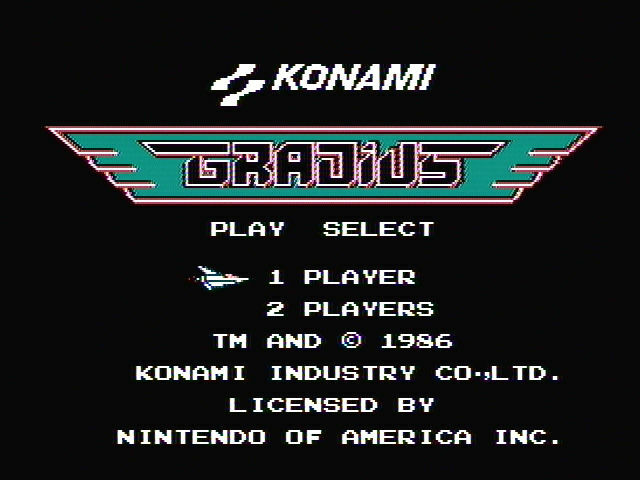 My first experience with Gradius has been on the NES Mini. At first to be honest I passend on this game because I wanted to try something more “famous” but when I started to appreciate and play space shooters, Gradius became an obligatory step and I spent a whole day alone from morning to evening to play it without being able to disconnect the console. I love when the title of the game is written with a good font and nice colours and that’s what happen with the military style logo of Gradius. It’s noth technically a splash screen but even the intro tune with the spaceship starting its mission in the space it’s quite good! We are 100% in the 8-bit era and Gradius is a perfet example of the visuals of the 80s. The most interesting innovation in the game is the already cited blend of technology and biology that creates an environment thet will beome very popular in the decade. The visuals are always perfect, no flickering and no slowings except one stace, the one with the rock-like alien creatures whoi try to hunt you with their long mechanical arms. That’s the only moment in which the fluid scrolling starts to slow down but I have to say that this is a blessing because otherwise you could be easily killed by the enemy fire. The pilot of the spaceship Vic Viper is alone against the Bacterion empire and has to defeat their base composed by strange and horrible biomechanic stuff. The plot itself is nothing incredible and we surely do not expect something more by a space shooter but the strong part of the plot is the setting that will become one of the defining features of the genre. Gradius has been an innovating games in many aspects. First thing the setting: in the games before Gradius the alien or the “invaders” were represented by pseudo-terrestrial “monsters” or spaceship willing to use Earth as a dump for their missiles. Here insted we see the first inteaction between a futuristic mechanical enviroment blended with repugnant alien organic matter. Today this setting is the standard of the traditional space shoot ’em ups but back then Gradius was the first to popularize this philosophy. Even the power-ups mechanism is different from similar games and, among the major games, has remained pretty much an isolated case. Instead of a list of different power-ups that can be collected for different effects, in Gradius we have a unique power up in the shape of a red energy ball but the effects of the power-up itself can be different: the enhancements bar we see on the bottom of the screen allow the player to select which a specific improvement to the spaceship depending on how many “spheres” are collected. Of course if you get only one you can choose only the “weakest” enhancement, a boost that increase your speed, but if you get two, three, four or five “pills” you can get more powerful improvements: the last one, indicated with a question mark placest two amoeba-like creatures in front of the spaceship that act like a shield that depletes hit after hit. 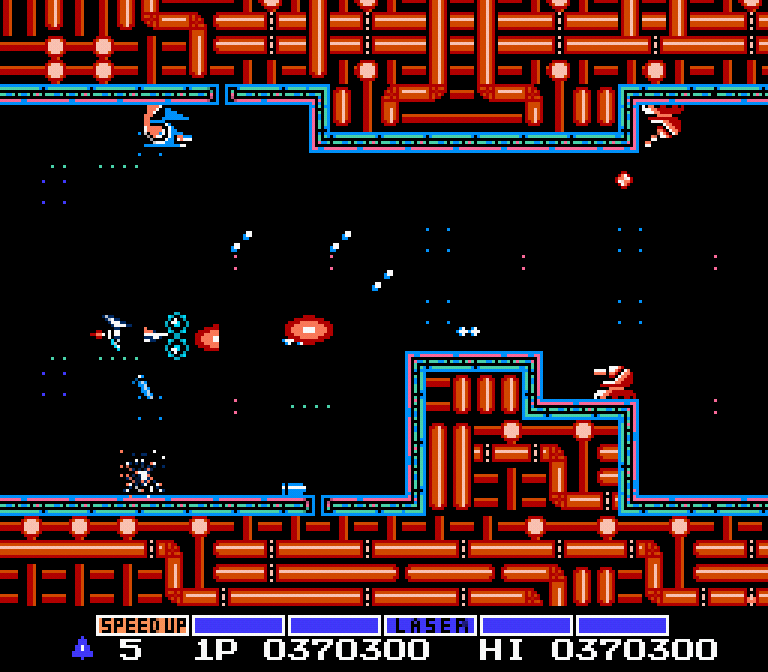 For the rest Gradius is a classic space shooter with a boss at the end of each stage, represented by the same laser-firing alien spaceship. Talking about bosses, this is probably the only bad aspect of the game. 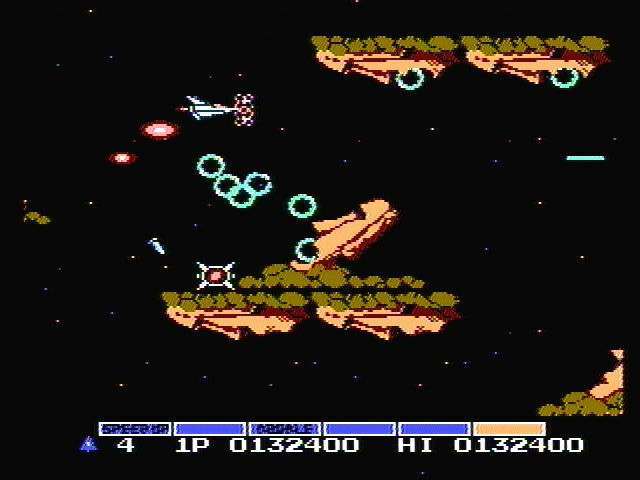 Even though you can’t really tell when a stage is over because there’s no information about it and, at least in the first screen, the setting remains the same, the bosses are all the same and all easy to negotiate, you just need a bit of speed to be faster than the enemy ship in order to dodge the lasers. What’s really hard in the game is to GET to the end of the stage. The last two are a nightmare because the more powerful you are, the more pissed off the aliens are and they will dump a hell of bullets against you. The stages are so enemies-dense that the final boss comes as a relief, as the only moment in which you can let your guard down for a while. The very last boss, the Brain, that will spawn an offspring of similar creatures in the years to come, it’s absolutely disappointing and probably the cheapest boss I’ve ever challenged in a game. As far as I’m concerned he’s defenseless: I started to fire at him with all my fury and he didn’t respond so after like 10 second of lasers he was gone. Seriously you are at the last boss of an hard game in a room without escape with a brain that occupies half of the screen and you can defeat him just spraying a few lasers? This thing left me really discouraged and mortified. Very precise, sometimes even too much, especially if you stock up on speed power ups that makes your ship impossible to maneuver. With the A button you fire (no it’s not B as in all the games, who knows why…) and with B you activate the chosen power up. There’s no automatic turbo function: if you keep A pressed you can fire continuously but at a low rate so you have to do the old button-smash and press A till yout thumb bleed. If we do not consider the boss battles that are the easiest thing on the game, the rest is quite hard. Probably not the first two stages but from the third the things become harder and harder. The Moai stages is a bubble nightmare and it’s almost impossible to get past safe as much as it’s hard to avoid all the fire in the last stage which is like a corridor. Thanks to the save function of the NES Mini I managed to complete the game but I’m sure that since THERE ARE NO CONTINUES I would be stuck at stage two if I were playing on the original NES cartridge. Gradius is known for having easy endbosses. Then again, the stages leading up to them tend to be pretty difficult; one could argue that the entire final stage is a boss fight. I like the overall gameplay of Gradius, but I’m not a really big fan of losing all your power-ups every time you lose a life; it basically makes it so you have to complete the entire game in one go to have the best chance of winning.